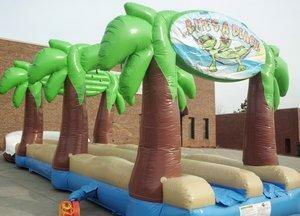 Slide into summer with this Lazy Lizard Dual Lane Slip and Slide. Keep cool parents, you can slide on this as well as the kids! With the two lanes you can race your opponent and splash your way to the end, then start over again. This awesome water slide is 32' long!